OK, I wimped out of the serious rain at the Ballard Market... it was really pouring here in the north end, but my husband and I did manage to take a short walk and enjoy the crisp air in a nearby park along Lake Washington. The heavy gray clouds burst open again as I was sketching in a non-permanent ink pen, and I caught some interesting rain drop effects on my quick sketch. I later added some color and a few more pen strokes. 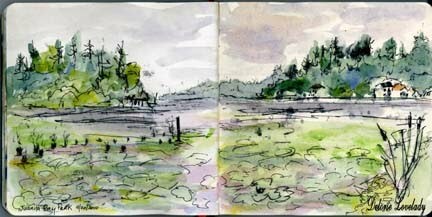 Juanita Bay Park is a great park in Kirkland -- Lots of interesting scenery here: water lily pads, old posts from a long gone ferry, plank walkways, surrounded with some wetlands, and buildings off in the distant shorelines. I did get the flavor of a market as we stopped to shop at our favorite IN-door fruit and veggie market on the way home as the rain continued... I'm so glad you are all sharing your sketches! Wimp or wise? it's hard to say! We got pretty wet. Nice sketch. The clouds look ominous. I'll have to try the park.